ickledot takes photos - of people 'doing stuff'! As you will have seen, the photography is centred on rugby union. ickledot loves to capture the passion and athleticism within this wonderful game. Yes, it's great to have a background of thousands of cheering fans but the game is the game, even when viewed only by the proverbial 'one man and his dog'. Played by men, women, girls or boys, it demands speed, strength, teamwork and a willingness to go through levels of pain. ickledot admires the people who play this game so much and he hopes this is reflected in his work. ickledot has been seen on the touchline of many Yorkshire clubs and has also taken photographs of the county's representative sides at senior and junior levels, both men and women. This has taken him to Twickenham no fewer than four times. 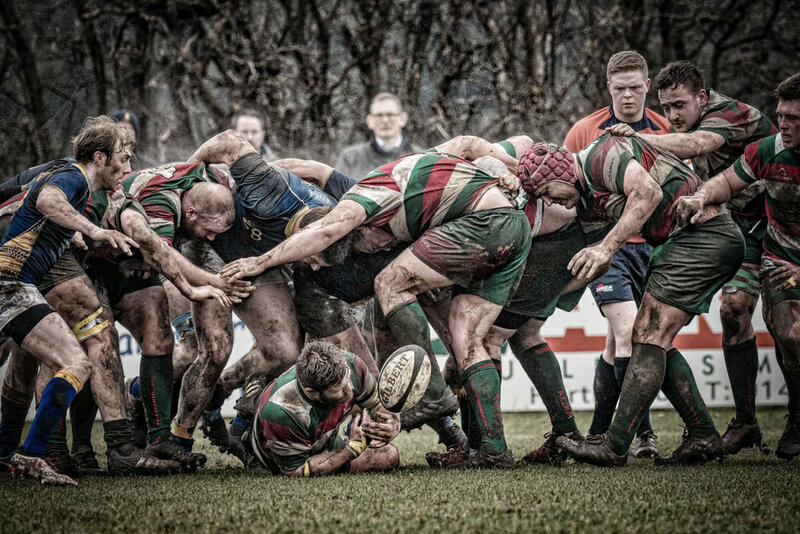 In 2015 ickledot became home photographer for Doncaster Knights Rugby Union Club which currently plays in the second tier of English rugby. In the spring of 2016 he was lucky enough to photograph them in their quest for Premiership status, including an exciting second-leg final play-off at Bristol Rugby Club - they won the game but narrowly failed to gain promotion. In 2017 ickledot was asked to photograph the England Women's squad in a training session at Bishop Burton College in East Yorkshire. He also provided images to Gilbert Rugby for their social network campaign during the Women's Rugby World Cup. Some of his images were also used in a film created for the RFU. More recently ickledot has provided photography for several articles in the Rugby Journal. ickledot also takes photographs for the fund raising unit of the charity, Sue Ryder, which provides care for those with serious illness. In the spring of 2015 ickledot held his first exhibition of rugby photographs, Rugby Union Yorkshire, first at Bradford Industrial Museum and then at Leeds Central Library. A booklet of the same name accompanied the display. ickledot has continued to provide design and digital image processing services for Bradford Industrial Museum. In addition he has also provided photographs for English Heritage at Stott Park Bobbin Mill and Furness Abbey in the Lake District. ickledot is resident taker of photographs at Scarborough Blues Festival and also the P&O Blues and Rock & Roll Mini Cruises across the North Sea to Amsterdam and Bruges. Main Cameras: Olympus OMD Em1 MkII x 2: a huge change has taken place over the last year. I’ve now gone completely mirrorless. This began last Autumn with the acquisition of my first Olympus. It came about primarily from the need/desire to have a longer lens to capture more distant action and also to avoid spending the £7000 or so needed to do so with Canon. It still cost me quite bit of money but it was made affordable by selling some of my Canon equipment. So, for the 2017-18 rugby season I had the Canon described below along with the Olympus and a M.ZUIKO DIGITAL ED 300mm 1:4.0 IS PRO lens. Super sharp, it has range of 600mm full frame equivalent. A year on and I’ve now bought another Olympus (used) and a lens to replace the 70-200mm Canon one (also used). The whole kit is much smaller and lighter than my Canon versions and overall I’m pleased with the switch. The jury’s still out as far as autofocus is concerned. Shots are missed but then again they were also missed with the Canon. However, when the Olympus is sharp, it’s REALLY sharp! Other benefit for me is the often disparaged electronic viewfinder. It’s such a delight to view and edit pictures ‘in the field’ without having to use a back-of-camera LCD screen. Can confuse people though as they often think one’s taking a picture of the ground. I’m leaving the Canon description below as I still own the gear although it’s not been used for a while. Canon 7D MkII: It's taken quite a few years to reach the dizzy heights of a single digit Canon DSLR. Why Canon? Can't actually remember but it's certainly true that, when money is tight, once a choice has been made and a couple of lenses bought, it's very difficult to change. The first Canon was a 450D, then a 500D and a 550D with the compact little-mentioned 100D somewhere along the way as well. With each of these there was a period of learning how it worked and then moving on when it didn't quite manage what was wanted. Each time the old camera was sold in part exchange to buy the new one. The 7D MII is a great camera. Seven frames a second and most effective in poor light which is just the job for our dark British winters. It's not a full frame camera which obviously has its disadvantages but the extra reach it gives a lens such as the 70-200 is much appreciated when shooting rugby. While not one of Canon's biggest cameras, it's still quite bulky, particularly with a long lens attached and ickledot is getting on a bit so doesn't enjoy the weight. However, the excellent auto focus which this camera possesses cannot currently be matched by the new smaller, lighter mirrorless models. When it can, ickledot will seriously consider a swap but not yet!